Eye: The Robust Character is amber in color, and the Subtle Strength is lighter. Nose: The lighter has bursts of dried roses, vanilla and honey. It is well balanced. Palate: The lighter gives a refined palate. Flavors of spice, fig and peach come to the fore. It can be well balanced with the generosity of the stronger Cognac. For the first time in the history of Cognac, Cognac lovers will be invited to try the art of Cognac blending themselves, with the rare duo of Hennessy Diptyque. Hand selected by Master Blender Yann Fillioux, this is a one of a kind Cognac degustation. Consisting of two half-litre bottles of Hennessy, they are distinct in character. Between them, they contain eaux-de-vie dating between 1990 and this day, and are therefore classed as a Reserve Cognac. The one is named “Subtle Strength”, and the other “Robust Character” and are presented in a black and white labeled decanters. In correct Cognac terminology, they are named “cuts”, and it is with such cuts that a Cognac is assembled. Some of them contain the treasures of the Hennessy maison, and have been meticulously selected by Fillioux. The “Robust Character” cut of the Diptyque duo is Yann’s way of revealing the “strength” of the Hennessy Cognac, and is amber in color. The “Subtle Strength” Cognac is more balanced, with a lighter color and a velvet texture. It is endlessly light and fragrant. 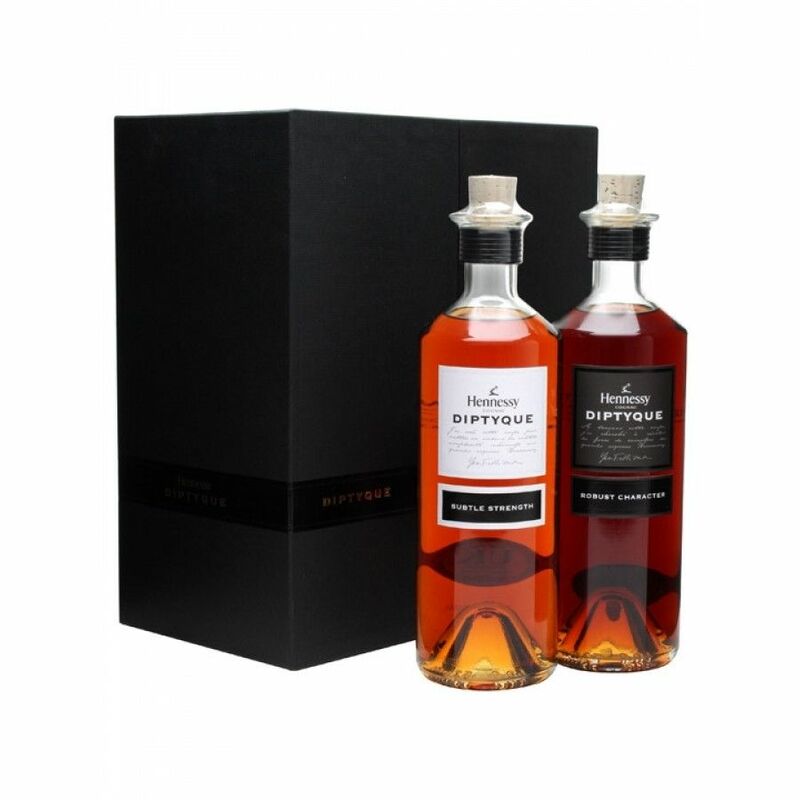 Bring the art of generation-old Cognac chemistry to your own drinks cabinet - this is the ideal Cognac to enjoy for a special occasion with family, friends or fellow lovers of this fine drink. The Hennessy Diptyque Cognac also makes for a wonderful gift. This is a limited edition from one of the largest Cognac producers in the world, and is Hennessy’s way of giving us a dual taster of what precious eaux-de-vie they have hidden in their cellars. A truly premium Cognac that allows for innovative experimentation and for you to develop your taste buds in creating your own personalized blend. This selection of Cognac is presented in a charcoal colored case and open in a way that is similar to a tasting room; to the side. The two bottles are reminiscent of “roller bottles” which would have been traditionally used by the cellar master to conduct tasting ceremonies. Colored white and black to indicate the strength, the bottles are encased in a pink and gold interior within the box. The bottles arrive in two 50cl decanters. Enjoy this careful blend neat to enjoy the fruit of your own craft.